Betfair (Click here to open account and get £25 FREE) has a separate operation in Australia. All Australian sports are available on Betfair Australia website. Australian sports market are not visible on main pages on BF main website. If you are browsing through the main pages e.g. Cricket on BF main website then you might not find BBL matches. In order to find BBL markets follow the steps as described in following screenshot. 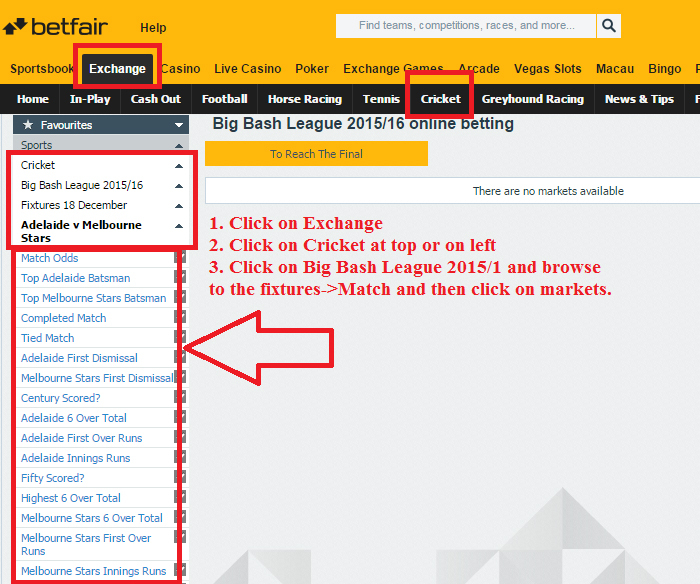 BBL markets are available under Exchange->Cricket->Big Bash League 2015/16 -> Fixtures and then navigate menus to find market. i am win the bet in betfair. but i cant get back credit to my account? what can i do? You didn’t describe in details what is wrong with your account. So I’m just guessing. If you have won on any Australian sport then your money will be in Australian wallet. You can transfer it to your main wallet and then withdraw. what happen my bets when match stoped due to rain and no result? Depends on market and it’s settlement conditions. http://bettingadda.com pe premium membership lelo fir udhar hi chat kar sakte ho. If you want to recover loss then take premium membership on http://www.bettingadda.com/ and I’ll guide you how to recover loss. HELLO SIR PLZ SEND YOUR WATHSAPP NUMBER SIR! bettingadda resition how to benefit?